I’ve spent many years as a sworn enemy of fruit in curries. Too often, adding fruit to a perfectly adequate, flavorful Asian or South Asian dish renders it a sickly-sweet abomination geared towards the kind of people who think garlic powder is exotic. 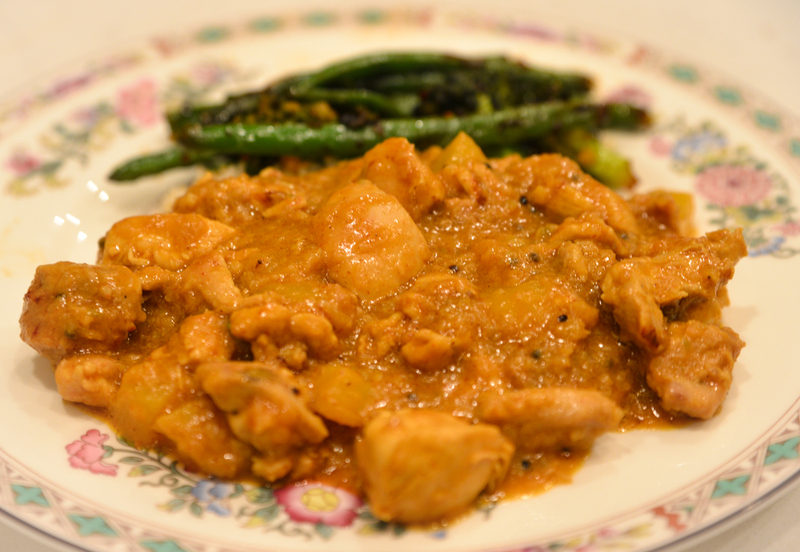 However, I made an exception for this South Indian-ish chicken mango curry, and I’m very glad I did. It’s delicious, easy to make, and produces superb leftovers. The combination of coconut milk, toasted Indian spices, and chili with fresh mango chunks produces complex, tropical flavors that are a pleasantly aromatic antidote to the pure existential misery of winter. It is eminently adjustable to different palates and spice-tolerances, which makes this dish a good choice for both your flavor-phobic in-laws from Nebraska, and your chili-obsessed expat friend visiting from Southeast Asia who has thoroughly seared all their tastebuds off. (That would be me). Due to either the boon or horrible imposition of globalization, depending on your political affinities, you can get a decent fresh mango most anywhere in the winter months. I guess you could use frozen mango if you were desperate. Dark meat chicken is heavily suggested. The curry leaves are a brilliant addition if you can find them. The frozen ones work, too. It would be pretty good with shrimp if you were so inclined. 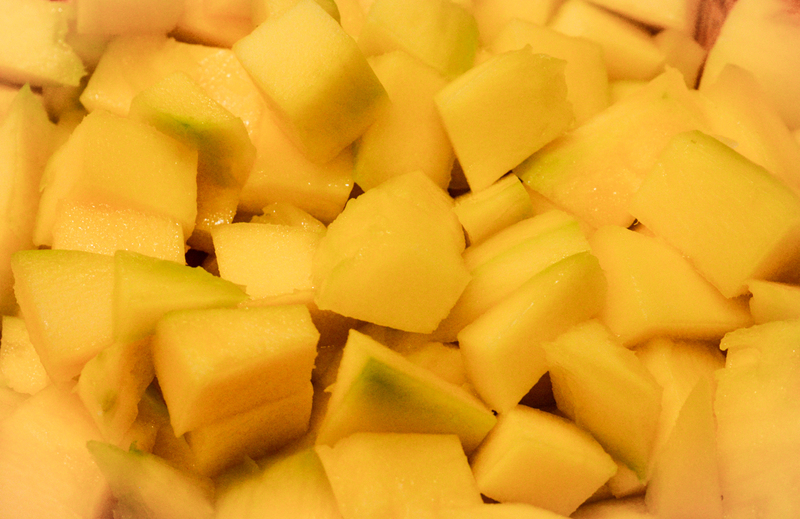 1 ripe fresh mango, peeled and cut into chunks. 1 serrano or Thai green chili – add more if you like super-spicy. Tablespoon of sambal chili paste. Sriracha is a fine substitute. Omit if you come from the Delicate Stomach tribe. Vegetable oil – olive oil works fine. 4 or 5 cardamom pods, broken open. 1/2 tsp of cardamom powder works fine as a substitute. 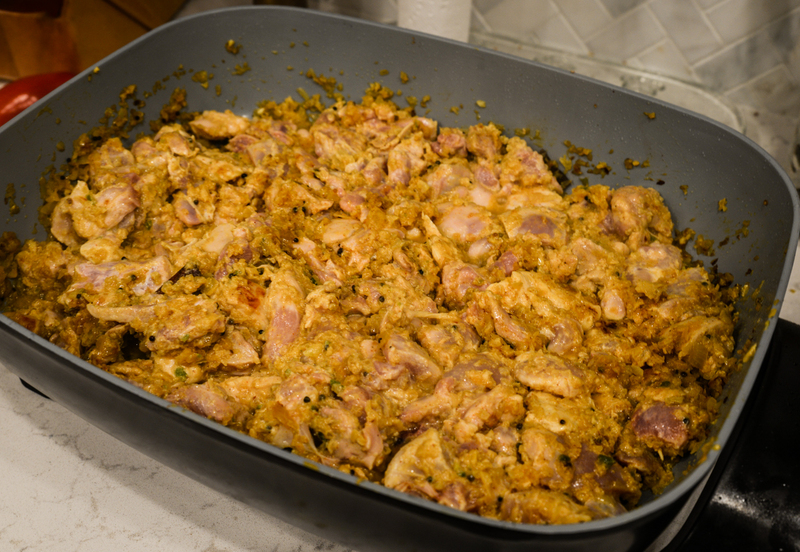 If you have the time, marinade the chicken overnight in yogurt, combined with a tablespoon of curry powder. No one will die if you do not have the time to do this, so don’t sweat it. 1. Finely chop – using a knife or a food processor, I’m not judging – and then combine the whole Serrano chili, ginger, onion, and garlic. Set aside. 2. In a large, deep pan or skillet, heat the oil until shimmering. Throw in the mustard seeds, cinnamon stick, cardamom pods, and curry leaves, and cook for roughly a minute, until the mustard seeds begin to pop. If the oil is too hot, the mustard seeds will ricochet into your face, which is exceedingly startling. 3. Add the curry paste. Add the turmeric, curry powder, and cumin. Add the cardamom powder if you weren’t able to find the pods. Cook until the vegetables are aromatic and soft. Chicken added. Electric skillets are rad. 4. Add the chicken, and stir until it’s reasonably browned – roughly 3 to 4 minutes. 5. Add the can of coconut milk and stir to combine. Taste, and adjust the spices if needed. Add more chili paste if needed. Add salt and pepper as you see fit. Cook for 15 minutes covered at low heat. 6. After 15 minutes elapse, add the chopped mango. Cook for 5 more minutes at low heat. Should look like this halfway through. 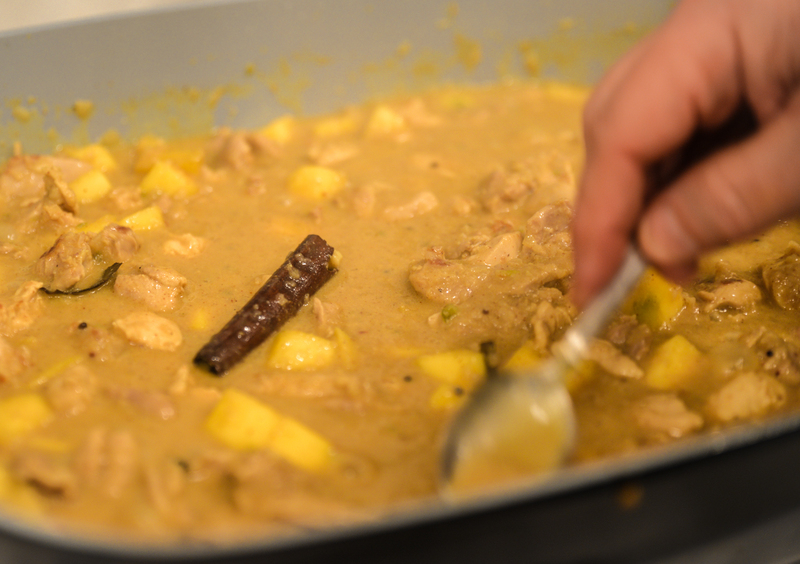 No, I have no idea how to photograph curry attractively. 7. Taste again, and adjust as needed. Uncover, turn the heat up to high, and reduce for about 5 to 10 minutes until thick and slightly caramelized looking. Keep stirring it to avoid burning. 8. Eat it. I like to serve this with a raita made with plain Greek yogurt, diced cucumber, olive oil, and lemon. Good with basmati rice as well. This makes beautiful left-overs, so I suggest making more then you can eat in one go, and keeping it aside for the next day. It also freezes very well.